SCP-283 displaying its rare properties. Special Containment Procedures: Due to the strange but harmless nature of SCP-283, it is to be kept in a secure box against the east wall of room E-107 at Site-137. Aside from that, SCP-283 can be handled by any personnel as long as they are observed by at least a level 3 member of staff, who is to keep watch over SCP-283 to prevent petty theft. Description: For all intents and purposes, SCP-283 is an ordinary rock, slightly mottled and worn from age and collisions, made of dark gray granite. It weighs just over 1 kg and is 10 cm in length. However, instead of following the usual route of gravity, SCP-283 is pulled in the direction of exact magnetic East. Close study reveals that SCP-283 is, in fact, falling around the Earth as well as being affected by its odd gravitational pull. 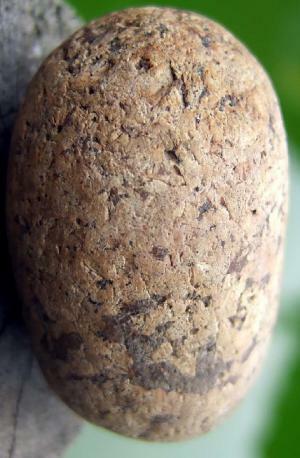 The rock was first found after an investigation of poltergeist activity in ███████, Australia. Reported as the phenomenon known as 'Min Min lights,' which are in fact known to be ████████. See document [DATA EXPUNGED] for Dr. ████ █████'s notes on the subject. According to witnesses, the rock purportedly hurtled across the plains, through the walls of a house and a car, and was eventually stopped by a mobile trailer home, where it remained lodged in the metal wall until the following morning. At first, Agent █████ believed it to be attracted by some magnetic force, although subsequent testing has proved this false. SCP-283 is an ordinary granite cobble, apart from falling in the wrong direction. Agent █████ accidentally dropped SCP-283 and was forced to chase after it. The retrieval involved a minor head injury, but confirmed suspicions about its nature. It has come to the attention of the higher level personnel that someone has been stealing SCP-283 for use as a paperweight. I don't care how 'zen' it looks, any further misdemeanors will be dealt with severely.